Hels has been crafting in one form or another since she was a little girl when she used to cover herself, her Grandma and every available surface with glitter and cotton wool. She really got bitten by the paper crafting bug back in 2003 when she took up card making and scrapbooking. A chance meeting with Tim Holtz in 2007 made Hels realise that her true passion lays with anything inky and stampy. She created her blog, the aptly named Ink On My Fingers (pinkleart.blogspot.co.uk) in September 2007, where she shares snippets from her daily life along with tips, techniques, tutorials and artwork. Hels is a Train Driver by profession but sadly had to retire due to ill health in 2009. She candidly says that the only things that kept her sane during those first dark months are her husband Graham, her cat Alfie and her love of crafting. Since then she has been published in several craft magazines and is currently on the Craft Stamper Design Team. Hels is a Certified Ranger Educator and travels the country teaching workshops and in-shop demo days and she is also a member of the 2014 Darkroom Door Design Team. You can also see Hels demonstrating for Creative Expressions on Create & Craft TV. Hels has brought her art and passion for crafting to Create & Craft with her favourite products: Tim Holtz Signature lines, Ranger Ink, the wonderful Studio 490 range and paint and the Ranger Melting Pot. 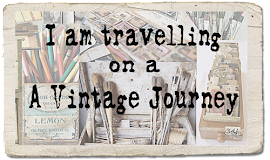 I am so honoured to be invited to be a Guest Designer for A Vintage Journey. I have been having so much fun making my contribution that what started out as a 6” x 6” card soon metamorphosed into an 8” Shadow Box! It is so easy to just let the ideas flow when I am working with my favourite products: Distress Inks feature in the majority of the creations I make and this one is no different. I already had in mind the words I wanted to focus on for my design, so with those in mind, I designed around those. Starting out with a piece of 6” square paper from Tim’s Crowded Attic collection, I used the Wrinkle Free Distress technique to add a little colour over the top of the neutral paper, using Broken China and Frayed Burlap for the inks. Once I had dried this, I added some Remnant Rubs to the paper and then inked around the edges with Broken China and Walnut Stain Distress Ink and also over the Rubs so they give a slight resist effect. Next I took a couple of the new Found Relatives cards and used my sewing machine to roughly stitch detail around the edges, using an Edge Trimmer to scruff the edges and then inking these with Walnut Stain. It was at this point I realised that my idea was a lot bigger than the size I had intended so I grabbed a plain wooden shadow box and painted it with Pitch Black Dabber, once dried I used my sanding block and took a lot of the paint off. This gives a perfect surface to add Walnut Stain Distress Ink to, so it looks a bit old and battered. Adding to the shabby look, I used my Texture Hammer and bashed the edges of the box to grunge them up a bit. I die cut Tattered Florals from some plain cream card and inked them with Broken China and Frayed Burlap Distress Ink, over stamping with Frayed Burlap and a large background from Papillon, making the flowers into shabby roses. The die cut leaves are from the new Garden Greens die – again cream card, this time inked with Forest Moss Distress Ink and then I shaped the leaves to add a little dimension. A folded Journal Ticket with a few more Remnant Rubs and Distress Inks was added to the side of the photo layers for a little more detail – and I also wanted somewhere to put my first word which is Destination. My next word was added to a little paper ruler I made up, of course, I had to use Art... is it what my whole life seems to be about! The final word is Journey and this is provided on a Philosophy Tag. I added various bits and bobs of Idea-ology to the shadow box and decided to stop! That is half my problem, I never know when to stop with the embellies! 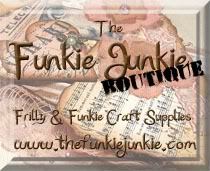 I hope you like my creation – thank you ever so much to the lovely folks here at Vintage Journey for inviting me to be a guest on your amazingly talented team. 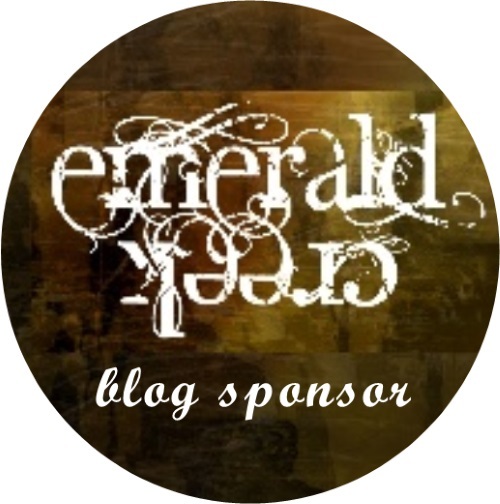 To find out more details about Hel’s wonderful project please pop over to her blog. Thanks Hels this is a fabulous vintage creation which perfectly shows your amazing style. I hope you will join us again sometime in the future and share more of your gorgeous work. There are still five more days for you to enter our second challenge ‘Say it with Words’ which is hosted by Alison (Butterfly). We already have the most amazing collection of projects entered and look forward to seeing yours. Remember you don’t have to use Tim’s products to be able to enter but we do want to see how your entry has been inspired by him, that might be a technique he has taught us, a project he has done which you are using for inspiration or a colour palette he has used. Do tell us in your post what it is that has inspired you. I am making another plea to ask that you please turn off comment verification if you would like one of us to leave a comment on your project. Writing in numbers/words takes time and can often be keyed in incorrectly preventing us from moving quickly through the projects so that we can get round everyone. Lets face it we would like to be creating and making too rather than filling in little boxes. On my own blog I have Comment Location set to ‘Pop Up window’, Who Can Comment is set to Registered Users and I do not have word verification on; I have set comment moderation to ‘sometimes’ – For posts older than 5 days. With these settings I rarely get any spam. Hope this helps you to re-set yours if you need to. It's absolute gorgeousness! What a thrill to see one of my new favorite artists here to share this beautiful piece! Thank you always for your marvelous inspiration! Love Hels' vintage frame - what a great project. I don't have comment verification on my blog, hate it - but you do on here, ROFL. Welcome Hels - great project. Well Deserved! What a gorgeous project, showing off all those fab Tim goodies perfectly! Hels, what a wonderful work of art you have shared with us! Love all the details and perfect combination of embellishments. The layers and flowers are out of this world gorgeousness! Hugs! Stunning project from Hels, every detail is gorgeous. Thank you, thank you, thank you everyone for all your lovely comments! Am smiling biggly!!! Gorgeous shadow box from a very talented lady. So pleased you were able to join us here at The Vintage Journey. Absolutely gorgeous work Hels. I love this shadow box. You never fail to amaze and inspire me.